This post is part of a series to augment the Tips for Writing Fiction available for free download. This and other writing workshops are gathered in my Workshops Directory for you to explore. Whether or not you subscribe to the mystical side of tarot, it remains a fantastic characterization tool. Tarot readings provide an in-depth snapshot of a person and what their life is like, as well as the influences driving them into the future. A normal reading comes together through a skilled interpreter and the overturning of cards in a meaningful order (positioned in what's called a tarot spread). 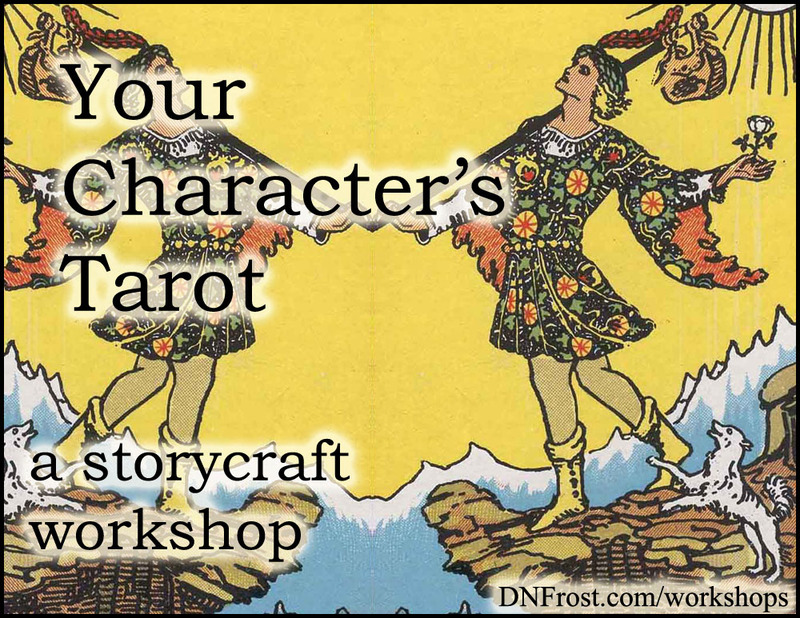 But to do a tarot spread for your characters, all you need is to fill out this worksheet with your insights and ideas. The exercise evolves from your character's personality, through external and internal circumstances, to their most likely future. This forces you to explore all the facets of a character before deciding where they'll end up, and creates room for inspiration to strike before you finalize the outcome. 1. Personality (center) - Write your character's name, and fill out everything you can about their personality. Include who they consider themselves to be, the labels they use for themselves, and their current stage of personal growth. 2. 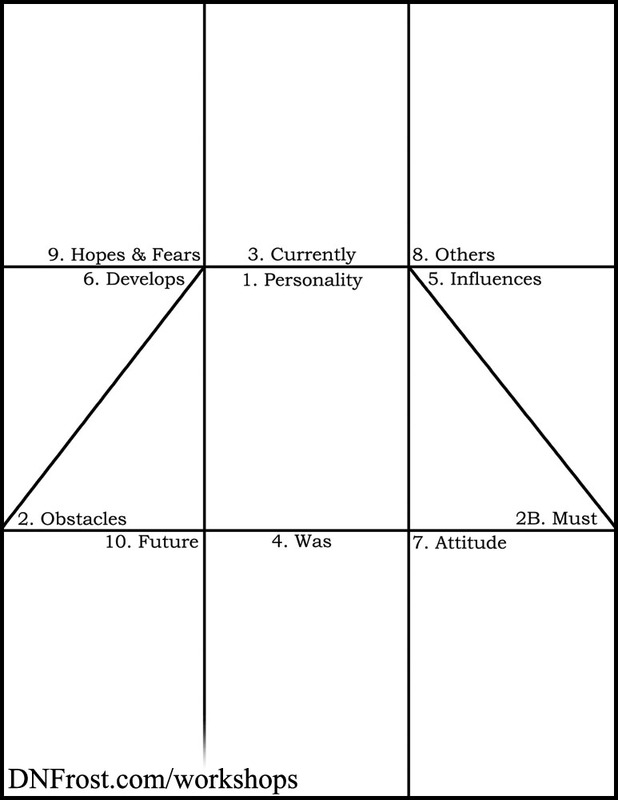 Obstacles (center left) - Write down the obstacles your character faces within their stage of personal growth. Also include any habits that dominate the character's behavior or mentality. 2b. Must (center right) - Fill in what your character needs to realize, experience, or decide to do in order to overcome these obstacles. 3. Currently (top-center) - Write everything going on in your character's life right now. Include the major plot events that impact the character, as well as any specific situations the character is dealing with. 4. Was (bottom-center) - Fill out things from the character's past that shaped the events you listed in Currently. Also write down any past events that will come into play for this character as the story unfolds, and who your character was at the time of those events, if their personality has since evolved. Check these Tips for Writing Fiction to see more workshops! 5. Influences (right-center) - Write down all the factors that are influencing this character. These factors can be other people and their motivations, external events shaping the plot, or the character's own suspicions, ambitions, hesitations, and desires. Include anything that shapes how the Currently events will unfold. 6. Develops (left-center) - Fill in how your character develops from their Currently stage into the future. Include their realizations, decisions, response to being influenced, and any other changes within your character as events unfold. Do not write future events here! Use internal developments only. Now you have a basic snapshot of your character's experiences, situations, and growth. These are externally-driven, for the most part. The remaining spaces explore internal factors that shape your character's reactions to external events, and where the natural momentum of the story is carrying them. 7. Attitude (bottom-right) - Write about your character's attitude in general--are they a cheerful person, or more sour? Do they expect things to go well, or go wrong? Fill in all defining mental characteristics, and with remaining room, their attitude toward specific Currently events. 8. Others (top-right) - Write how others in the story see this character. Start with friends and family, and fill out how they judge your character and their Currently events. Then explore more distant acquaintances--who hates this character, and why? If the character's famous, how does the public feel? Include anything that comes to mind about the opinions of others. 9. Hopes and Fears (top-left) - Fill out everything your character is hoping for or afraid of. Start with general hopes and fears, then fill in their feelings on specific Currently events--are they striving to create a good outcome, or to prevent a bad one? These innermost drives focus your character's decisions and bring about the story's future events. 10. Future (bottom-left) - Write down the events that unfold for your character. Reflect on how this future fits in--does it seem like a natural progression, or unexpected and externally-driven? Readers find comfort in a logical resolution, and expect a story to continue until the characters meet a fitting end. An externally-driven future is less satisfying, but often belies a sequel. For every book in my Tales of the Known World saga, I do one of these tarot spreads for each character, large or small. It sets the stage for the story to unfold, and allows me to bring hazy characters into clarity and precision. If I'm having trouble on a given scene, I use this exercise to pin down the exact stages of character development at that time. That's it for this post! Check out the latest writing workshops for more. You can download Tips for Writing Fiction here, or start your adventure below.